Now playing: Aaron Copland's exquisite 12 Poems of Emily Dickinson (1944-1950) sung by the much-missed Susan Chilcott, who died of cancer in 2003 aged just forty, with Iain Burnside piano (Black Box 8012510742). Copland's 1950 setting of Dickinson's poetry was pioneering and used early inaccurate editions, but that scarcely matters. About the cycle, the composer (below) wrote modestly: 'The poems centre about no single theme but they treat of subject matter particularly close to Miss Dickinson: nature, death, life, eternity. Only two of the songs are related musically, the seventh and the twelfth. Nevertheless, the composer hopes that, in seeking a musical counterpart for the unique personality of the poet, he has given the songs, taken together, the aspect of a song cycle'. 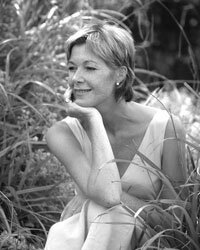 It was Susan Chilcott's portrayal of Ellen Orford in Britten's Peter Grimes – described by the Guardian critic Tom Sutcliffe as “a crown jewel of a performance” – at La Monnaie in Belgium, which in 1994 won her universal recognition, and led to appearances throughout Europe and in the USA. It is a terrible irony that, in the last of the very few interviews she granted (to a local paper, of course, not a glossy), Ms Chilcott (right) said “I am going to sing right through for the rest of my life.” And so she did. But she could not have known on that fine, Spring day in Somerset, that the ‘rest of her life’ would be less than six months. It is hard to make sense of a world in which such a shining light can be snuffed out so early. But a visionary Scholarship set up in Susan Chilcott's memory bring closer Emily Dickinson's cycle of nature, death, life, and eternity. Through the Scholarship new stars may emerge whose musical lives would otherwise have remained unfulfilled, and these singers will give something of the same delight to others. Susan Chilcott would have loved such a legacy, the Scholarship can be contacted via this link. 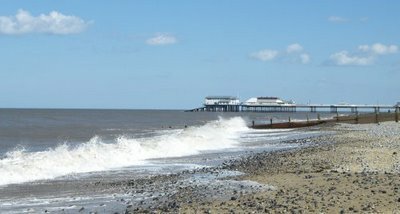 Photos:- Cromer Pier, Norfolk, 8th April 2006 by Pliable. 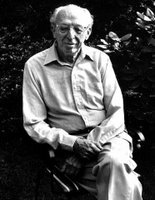 Aaron Copland from Congressionalgoldmedal.com. With acknowledgments to the Susan Chilcott Scholarship for use of text and photo. CDs featured in this article are available from Prelude Records.